In a rare moment, Meghan Markle sat alongside her 'Suits' co-stars this weekend at her first public event since attending Pippa Middleton's wedding with Prince Harry (where the color of her dress was up for debate) last month. 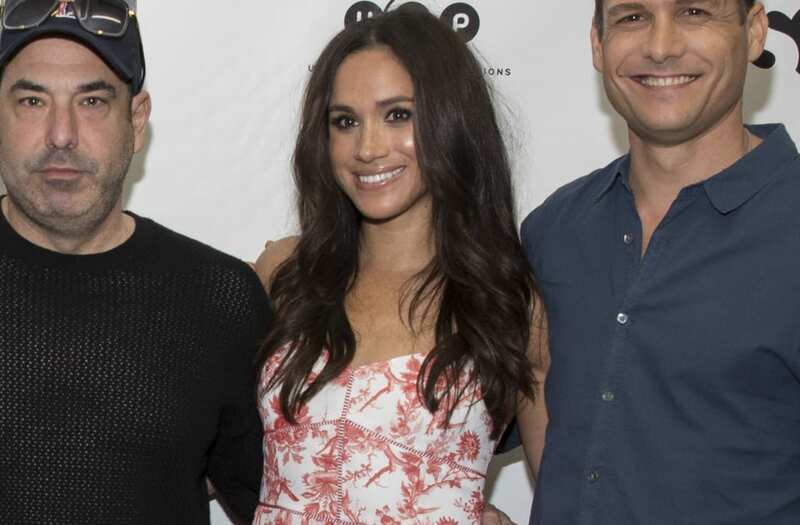 She and her fellow actors were celebrating the upcoming 100th episode by reading the script from the pilot, and Markle beamed while she sat among the cast she calls "family." Meghan put her summer aesthetic on display and stole the show in a modern, feminine red and white floral dress ($329 from Club Monaco). An affordable number, it actually costs less than her shoes! Her red strappy heels by Stuart Weitzman (a cool $398) were the perfect pairing, though, and she kept other accessories to a minimum. She wore her hair down in bouncy waves that perfectly matched the easy breezy look. The cast of USA Network’s legal drama "Suits" celebrate their 100th episode milestone on set in Toronto with an elaborate Pearson Specter Litt-inspired cake and champagne toast. "Suits" stars Gina Torres, Patrick J. Adams, Sarah Rafferty, Rick Hoffman, Meghan Markle and Gabriel Macht at the ATX Television Festival. After seeing her incredible interior design style, and how her fashion has evolved through the years, it's no surprise that Meghan's wardrobe continues to dazzle. "We'd all lived in the same corporate housing, so on top of working together we were living together which makes a whole different dynamic, I think. We just became this little family right out of the gate." Family is definitely what you need when you're catapulted to the level of fame Meghan has experienced since she began dating Prince Harry. As someone who has largely kept herself and her relationship out of the spotlight, it's fun to see her step out in style. We can only imagine as things progress with her red-haired Prince that, at first, Meghan will continue to stay under wraps -- until well, that surely-on-the-horizon proposal comes about. Who else is ready for the first joint royal event between Meghan and Duchess Kate?! Watch the full reading and Q&A event here.